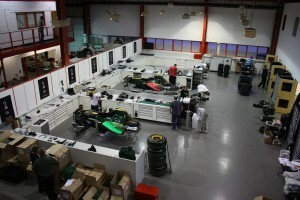 Two weeks is a short time in F1, but that’s how long Lotus Racing has had to fit in several months of hard work. 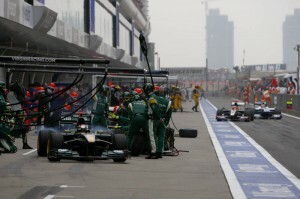 Since China, the team has, in order, beaten the Icelandic ash cloud, unpacked and repacked 34 tonnes of freight, run an intensive series of tests on Chassis T127-02, fitted an entire upgrade package to the race cars, taken delivery of its newly painted race trailers (in a matching colour scheme to the race cars) and flown the race team back to Barcelona. Jarno Trulli is also excited about returning to Spain, and Monaco, the circuit where he wrote himself into the history books by winning in 2004. “I made it back home from China with a number of the other drivers, but we got back safely and I’ve been home with my family since then. I’ve managed to fit in a number of good training sessions, and am looking forward to getting back in the car. I think I’ve had a fair bit of bad luck so far, but I’m looking to put that behind me and see how much further forward we can go with the updates. I’ve kept in close touch with the team about the tests they’ve put the car through, and am encouraged by the results they’ve had. I think we’ll take a good step forward in Spain. Team Principal Tony Fernandes has been thinking about how the team has established itself, both on track and in the hearts and minds of F1 fans: “We’re back in Europe and I couldn’t be more pleased with the position we arrive in. 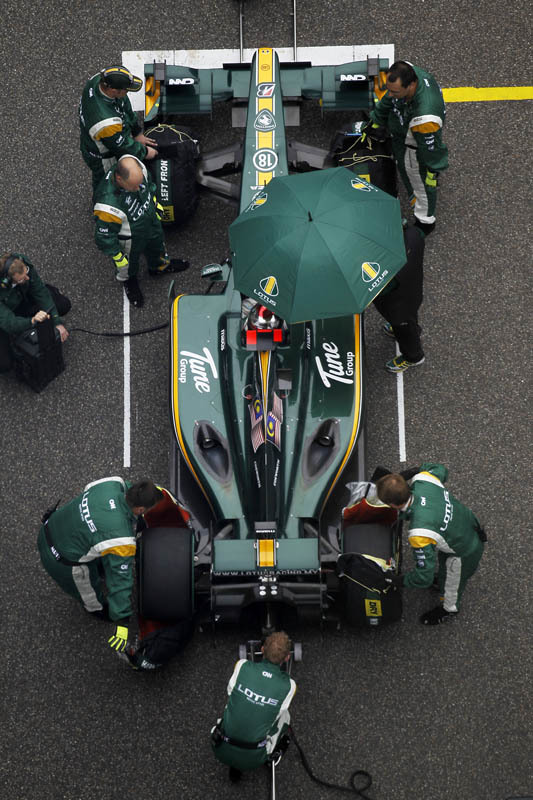 The first phase of Lotus Racing’s life is now behind us, and the next challenge starts here. We’ve proved all the doubters wrong, and have shown that the hard work everyone in the team puts is making the dream we share come true. I remember the immense pride I had when I first saw the cars run in the pre-season tests in Spain, and in Barcelona we’re back, ahead of the other new teams and with a new package that will help us push on closer to the next goal, which is to take on the midfield. 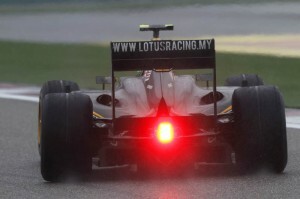 Ultimately it’s about taking Lotus Racing to the front of the grid and this marks the next step in that journey. Lotus Engineering has conducted a study to develop a commercially viable mass reduction strategy for mainstream passenger vehicles. This study, released by the International Council on Clean Transportation, focused on the use of lightweight materials and efficient design and demonstrated substantial mass savings. When compared with a benchmark Toyota Venza crossover utility vehicle, a 38% reduction in vehicle mass, excluding powertrain, can be achieved for only a 3% increase in component costs using engineering techniques and technologies viable for mainstream production programmes by 2020. The 2020 vehicle architecture utilises a mix of stronger and lighter weight materials, a high degree of component integration and advanced joining and assembly methodologies. Based on U.S. Department of Energy estimates, a total vehicle mass reduction of 33% including powertrain, as demonstrated on the 2020 passenger car model, results in a 23% reduction in fuel consumption. 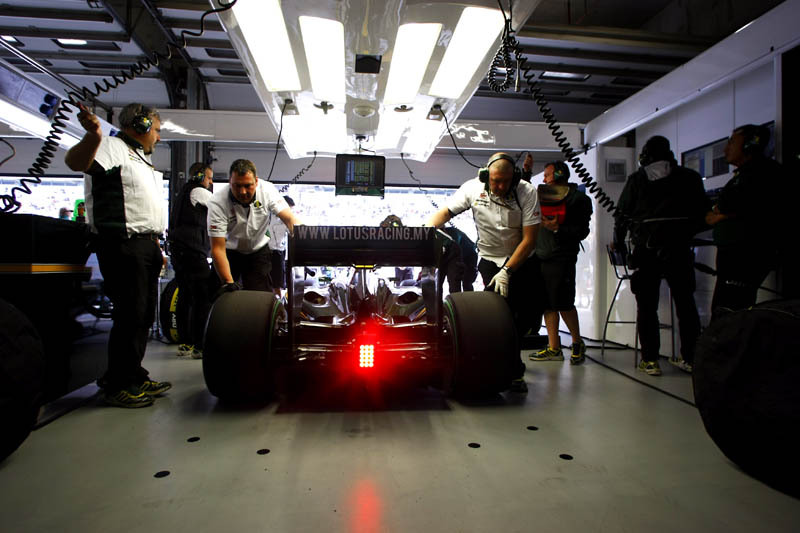 This study highlights how automotive manufacturers can adopt the Lotus philosophy of performance through light weight. The study investigated scenarios for two distinct vehicle architectures appropriate for production in 2017 and 2020. The near-term scenario is based on applying industry leading mass reducing technologies, improved materials and component integration and would be assembled using existing facilities. The mass reduction for this nearer term vehicle, excluding powertrain, is 21% with an estimated cost saving of 2%. A benchmark Toyota Venza was disassembled, analysed and weighed to develop a bill of materials and understand component masses. 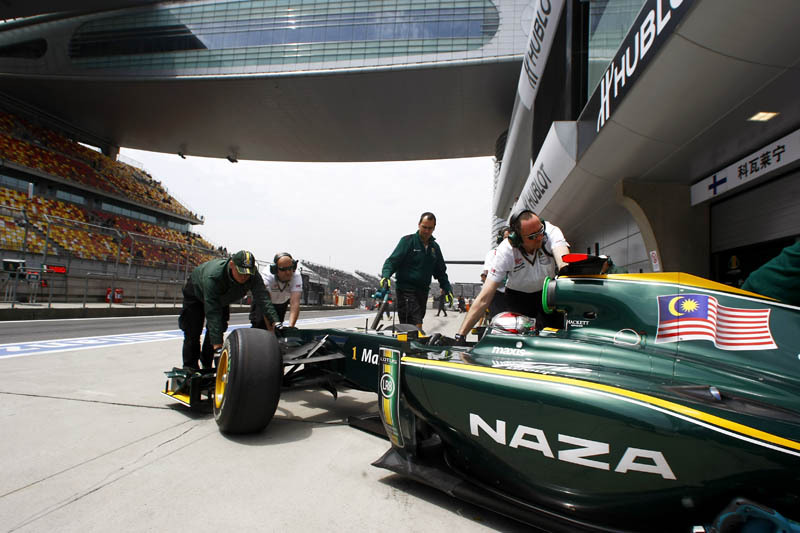 In developing the two low mass concepts, Lotus Engineering employed a total vehicle mass reduction strategy utilising efficient design, component integration, materials selection, manufacturing and assembly. All key interior and exterior dimensions and volumes were retained for both models and the vehicles were packaged to accommodate key safety and structural dimensional and quality targets. The new vehicles retain the vision, sight line, comfort and occupant package of the benchmarked Toyota Venza. The body includes the floor and underbody, dash panel assembly, front structure, body sides and roof assembly. The baseline Toyota Venza body-in-white contained over 400 parts and the revised 2020 model reduced that part count to 211. The body-in-white materials used in the baseline Venza were 100% steel, while the 2020 model used 37% aluminium, 30% magnesium, 21% composites and 7% high strength steel. This reduces the structure mass by 42% from 382 kg to 221 kg. The low mass 2020 body-in-white would be constructed using a low energy joining process proven on high speed trains; this process is already used on some low volume automotive applications. This low energy, low heat friction stir welding process would be used in combination with adhesive bonding, a technique already proven on Lotus production sports cars. In this instance, the robotically controlled welding and adhesive bonding process would be combined with programmable robotic fixturing, a versatile process which can be used to construct small and large vehicles using the same equipment. The closures include all hinged exterior elements, for example, the front and rear doors and the rear liftgate. One alternative approach included fixing the primary boot section to improve the structure, reduce masses and limit exposure to high voltage systems. A lightweight access door was provided for checking and replacing fluids. The closures on the baseline Toyota Venza were made up of 100% steel. The low mass Venza closures/fenders would be made up of 33% magnesium, 21% plastic, 18% steel, 6% aluminium with the other 22% consisting of multiple materials. The mass savings are 41%, a reduction from 143 kg to 84 kg. The interior systems consist of the instrument panel, seats, soft and hard trim, carpeting, climate control hardware, audio, navigation and communication electronics, vehicle control elements and restraint systems. There is a high level of component integration and electronic interfaces replace mechanical controls on the low mass model. For the 2020 model the instrument panel is eliminated replaced by driver and passenger side modules containing all key functional and safety hardware. A low mass trim panel made from a high quality aerated plastic closes out the two modules. The air conditioning module is incorporated into the console eliminating the need for close out trim panels; heated and cooled cupholders are integrated into the HVA/C module. The audio/HVA/C/Navigation touch screen contains the shifter and parking brake functions and interfaces with small electric solenoids. This eliminates conventional steel parking brake and shifter controls and cables as well as freeing up interior space. The front seats mount to the structural sill and tunnel structure eliminating conventional seat mounting brackets (10 kg) and the need to locally reinforce the floorpan. The composite front seat structure utilises proven foam technology; the seat mass is reduced by up to 50%. The rear seat support structure is moulded into the composite floorpan eliminating the need for a separate steel support structure. The front and rear seats use a knit to shape fabric that eliminates material scrap and offers customers the opportunity to order their favourite patterns for their new vehicle. Four removable carpet modules replace the traditional full floor carpeting; this reduces mass and allows cost effective upgrading of the carpet quality. The floorpan is grained in all visible areas. The 2017 production interior mass was reduced from 250 kg to 182 kg with projected cost savings of 3%. 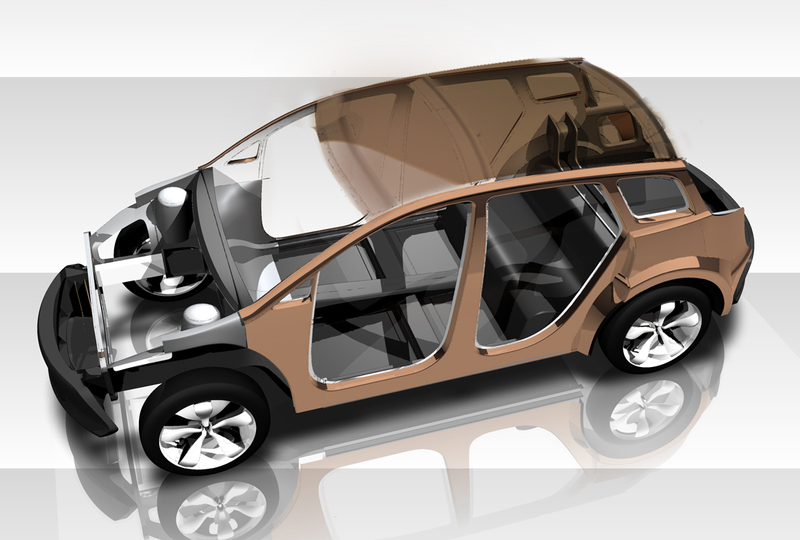 The 2020 production interior mass was 153 kg with projected cost savings of 4%. The chassis and suspension system was composed of suspension support cradles, control links, springs, shock absorbers, bushings, stabilizer bars and links, steering knuckles, brakes, steering gearbox, bearings, hydraulic systems, wheels, tires, jack and steering column. The chassis and suspension components were downsized based on the revised vehicle curb weight, maintaining the baseline carrying capacity and incorporating the mass of the hybrid drive system. The total vehicle curb weight reduction for the 2020 vehicle was 38%, excluding the powertrain. Based on the gross vehicle weight, which includes retaining the baseline cargo capacity of 549 kg and utilising a hybrid powertrain, the chassis and the suspension components were reduced in mass by 43%, with projected cost savings of 5%. 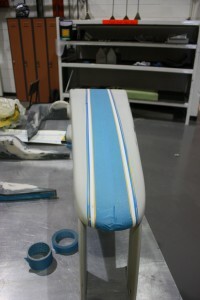 The materials used on the front and rear bumpers were very similar to the existing model to maintain the current level of performance. One change was to replace the front steel beam with an aluminium beam which reduced mass by 11%. The use of a magnesium beam was analysed but at the current time exceeded the allowable price factor. The air conditioning system was integrated into a passenger compartment system and an engine compartment system. This section addressed the under hood components which included the compressor, condenser and related plumbing. The under hood components were investigated for technologies and mass. The study showed a relatively small mass difference for the underhood air conditioning components based on both vehicle mass and interior volume. Because of the highly evolved nature of these components, the requirements for equivalent air conditioning performance and the lack of a clear consensus for a future automotive refrigerant, the mass and cost of the Toyota Venza compressor, condenser and associated plumbing were left unchanged for both the 2017 and 2020 models. The glazing of the baseline vehicle was classified into two groups: fixed and moving. The fixed glass is bonded into position using industry standard adhesives and was classified into two sub groups: wiped and non wiped. Factors involved in making decisions about glazing materials include the level of abrasion it is likely to see during the vehicle life, the legislative requirements for light transmissibility, the legislative requirements for passenger retention and the contribution it will make to interior noise abatement. The specific gravity of glass is 2.6 and the thickness of a windshield is usually between 4.5 mm and 5 mm, therefore the mass per square metre of 5 mm glass is approximately 13 kgs. The high mass of glass provides a strong incentive to reduce the glazed area of the body, reduce the thickness of the glass and find a suitable substitute that is lighter. Fixed glass on the side of the vehicle offers the best opportunity for mass reduction. The mass of the baseline glazing was retained for both the 2017 and 2020 models; this was a conservative approach. It is possible that coated polycarbonate materials may become mainstream in the 2017 – 2020 timeframe for fixed applications. The estimated mass savings for using thinwall cladding and copper clad aluminium wiring, as used on the 2017 model was 36% versus the baseline model. The lighting technologies section reviewed included diodes, xenon and halogen. The study also reviewed a variety of wireless technologies under development for non-transportation applications that could be used in this time period pending successful development for mobile applications. The full report, entitled ‘An Assessment of Mass Reduction Opportunities for a 2017 – 2020 Model Year Vehicle Program’ can be found at this link (pdf). 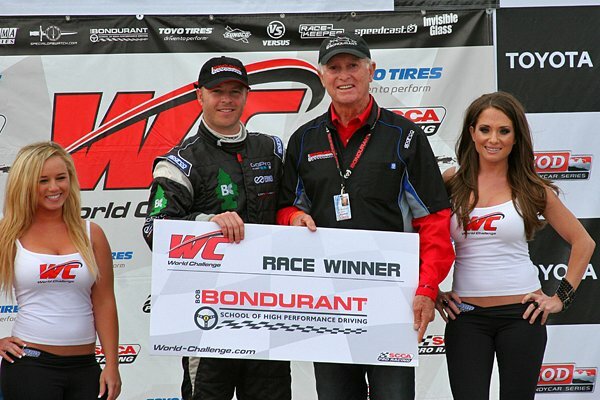 As we posted a few days ago, Tyler McQuarrie qualified on pole and won the GTS class at the SCCA World Challenge Event at Long Beach. He has just posted this video of his qualifying lap online – enjoy! 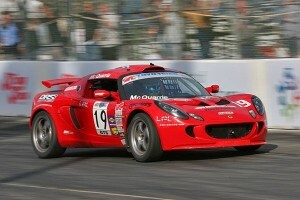 Tyler McQuarrie Qualifying Lotus for World Challenge from tyler@tylermcquarrie.com on Vimeo. See how Road & Track magazine tested the Lotus Evora trunk by stuffing a full-size human in the trunk. Tyler McQuarrie, of Walnut Creek, Calif., won the GTS class race of the Toyo Tires World Challenge at Long Beach. 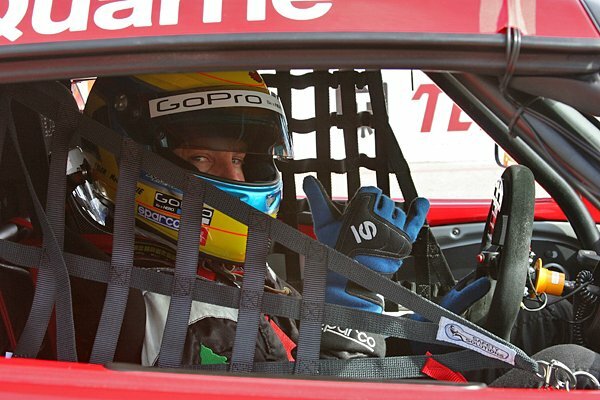 Making his World Challenge debut, McQuarrie took the GTS pole before cruising to a 49.535-second flag-to-flag victory in his No. 19 LPL/DRS/Switcars/LCS/Dayco/M&T Lotus Exige S.
The GTS win was the first time a Lotus had won a race of any kind at Long Beach since Mario Andretti won the 1977 Formula One event in a John Player Lotus. 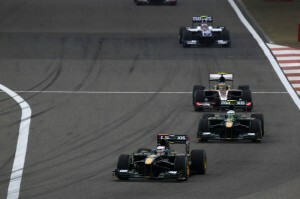 Lotus Racing’s first four races came to an end in China with another solid performance as the head of the new teams and for the first time coming out in front of one of their established rivals. 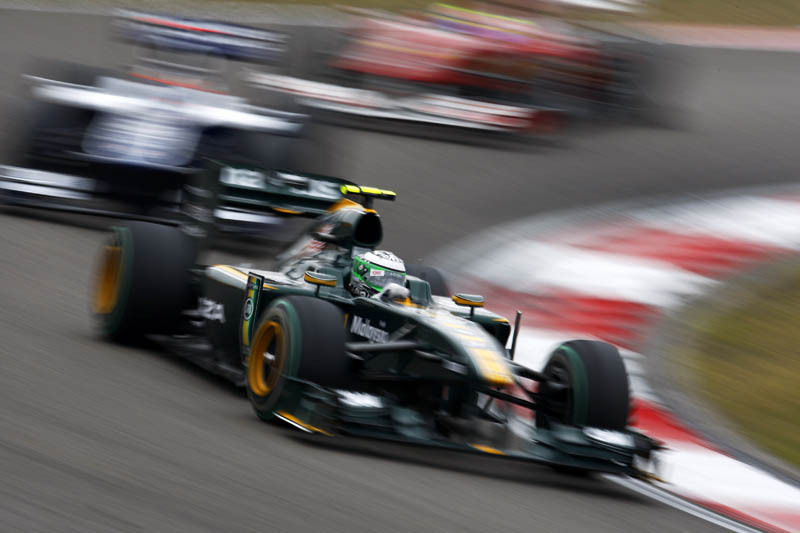 Heikki Kovalainen dealt with the tricky conditions superbly, making a bold call early on to stay out on dry tyres when most of the pack opted for wets, and finished the race in 14th place after a tight battle with Nico Hulkenberg’s Williams. 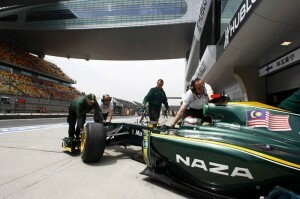 Jarno Trulli’s race came to a premature end on lap 34 after his run of bad luck continued in Shanghai in a race dominated by the damp conditions. 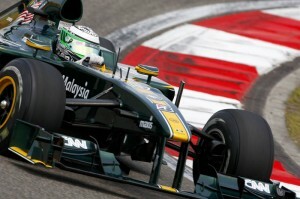 Heikki Kovalainen (T127-01, car no. 19, fastest lap 1.47.141): “This was a great way to round off our first four races. I think we had the correct strategy today in what were pretty tricky conditions. The pace was good – we were again ahead of the other new teams, and this time had a good battle with Williams. The decision to stay out early on dry tyres was made by me and the team together – it wasn’t wet enough to come in and as soon as the race started I could see the rain had calmed down so we agreed it was the right call to stick with the plan. 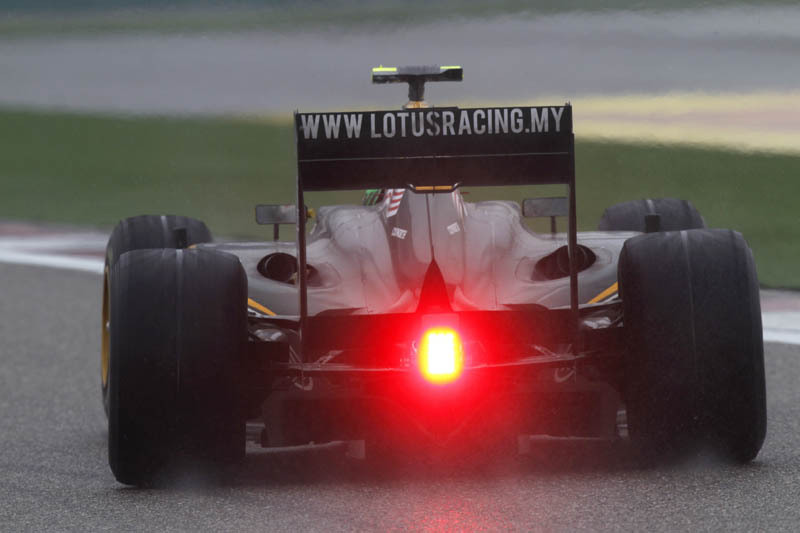 The other cars on wet tyres were obviously struggling so that worked out very well. It might not always work out like this for us, but today it showed we’re a good team who make the right decisions, so I’m really pleased, for everyone in Lotus Racing, and all our fans. 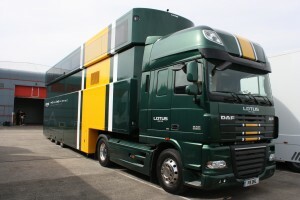 Lotus Racing Team Principal Tony Fernandes was one of the last people to make it out of Europe before most of the airspace was shut down, leaving Paris after being given the prestigious Officier of the Legion d’Honneur award in a ceremony on Wednesday, and arrived in China to see Jarno Trulli qualify 20th on 1.39.399 and Heikki Kovalainen 21st on 1.39.520 after a busy session at the Shanghai International Circuit. 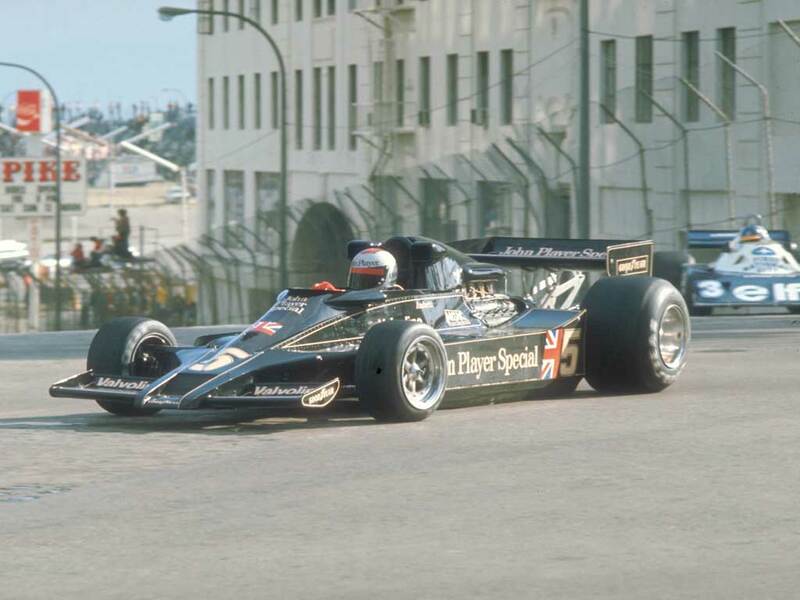 Both Lotus Racing drivers were out early in the session and despite an early spin for Heikki, settled down well, staying best of the new teams until the dying seconds of the session. After a strong showing in all three practice sessions the team looks in good shape for tomorrow’s race and will be looking to put on a good show for the growing numbers of their local Chinese fans, and the fast expanding Lotus Racing army across Asia and around the world. 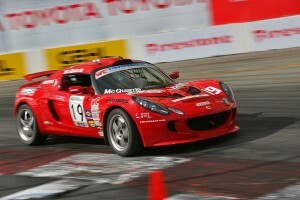 Registration for the first GGLC Points Event Autocross of the 2010 season is now open. This season the Golden Gate Lotus Club is creating a new trophy and classing system for our autocrosses. 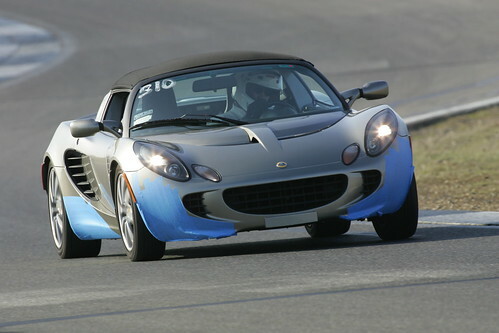 There will now be just one single consolidated trophy for all Federal Elise/Exige variants that replaces all older classes for street and race tires. The new trophy uses a PAX Index based classing system which is a commonly used handicapping system for comparing times of cars which are not in the same class. The index is composed of data from across the country, and tries to take the driver out of the equation and compare only the cars. Each class in the new Elise/Exige trophy has an associated PAX index which is multiplied against your raw run time to provide single comparable time that shows the driver performance within the car. You can determine your class using the GGLC Autocross Classification tool and entering your cars specifications and modifications. Once you have found your applicable class please enter that during the registration process. 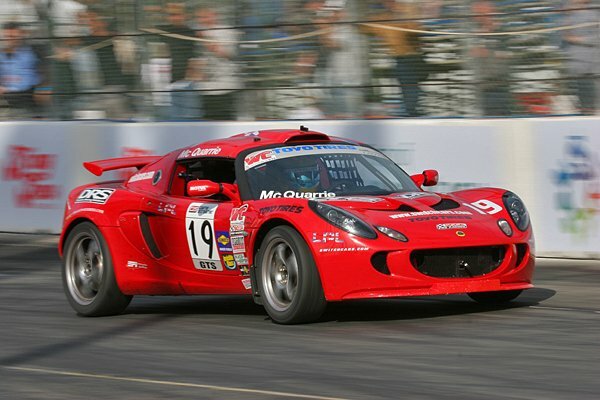 The points and overall winners for the 2010 GGLC Elise/Exige trophy will be based on the class-based, PAX-indexed times only. Additionally the Open Group trophy will now mirror the SCCA classification with no special dispensations for tire compound. Click here to register for the May 15th event. 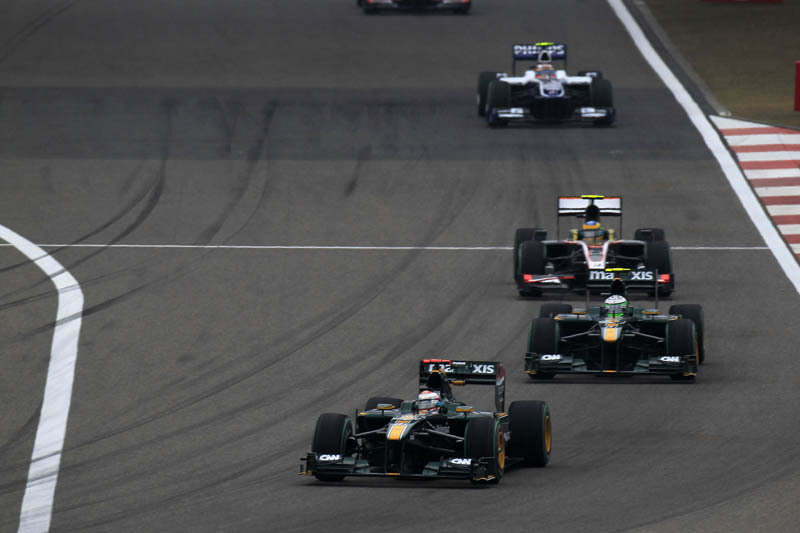 Spirits are high as Lotus Racing turns to China and the final race before the European season kicks off in Spain. The team is again focusing on reliability and the challenge of seeing both cars cross the finish line before its first major performance upgrade is unveiled in Barcelona. 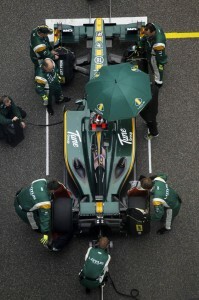 Heikki Kovalainen is a big fan of China, and is looking forward to the all aspects of the race: “I feel really good coming into the Chinese Grand Prix – I’ve had a few days of solid training and a bit of golf since leaving Malaysia and I love coming to China. We have some great fans out here – they wait at the hotel all night just to get an autograph and always give us really good presents to take home. Last year some girls took a taxi and followed us to the hotel with a Finnish flag hanging out the window all the way! The country has great food and a deep culture; every time I come here I see something new. 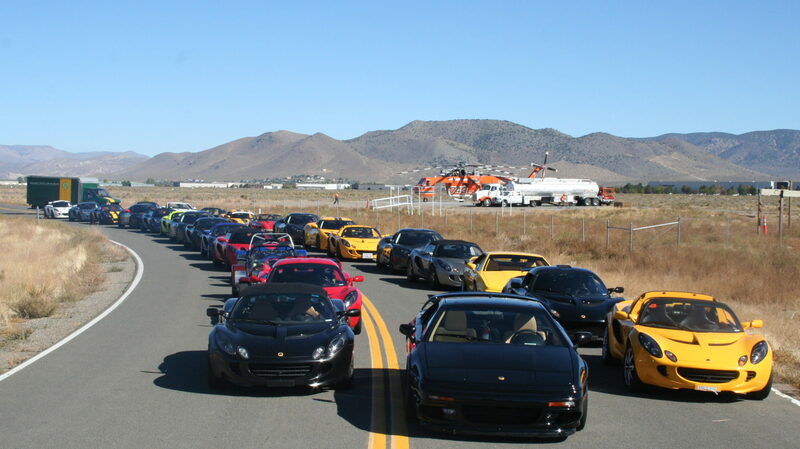 Registration is now open for the Golden Gate Lotus Club’s open track day at Thunderhill Raceway Park on Tuesday May 18, 2010. We will run this event with our usual three run groups in the regular direction (counter-clockwise). Weather should be good so make sure you get a slot by signing up early. Cost is still $145 for Lotus club members and $165 for non-members. You do not have to own a Lotus to become a member and yearly membership dues are $25.